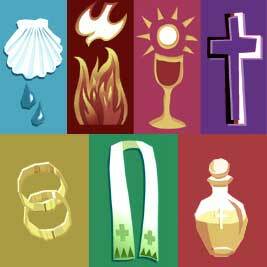 Celebrating the sacraments is at the heart of the life of our parish community. Sacraments are the people of God joining together as a community of faith not just as individuals. In the celebration of the sacraments we hope to promote a deeper engagement in the meaning, and a new appreciation of the beauty of the sacramental life of our church. We do this by actively involving people in planning and celebration of all our sacraments, including our Station Masses, Confirmations, weddings, funerals, and baptisms.